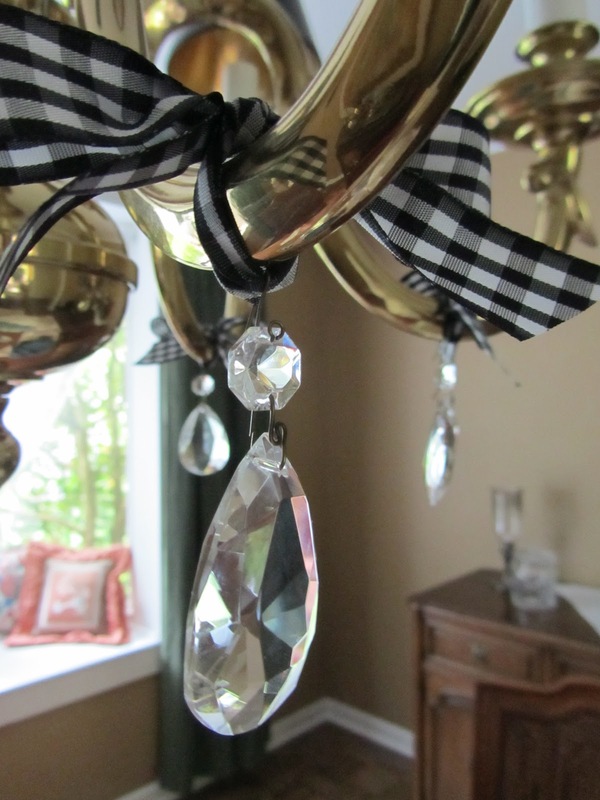 The first house that I remember of my grandmother's had a small crystal chandelier over the mahogany dining table. My grandmother always lit candles at dinner. The way the light in the room danced across the walls, as the crystals reflected it, I thought it was the most beautiful thing in the world. That longing for a crystal chandelier remained with me. However, I never lived in quite the right house to hang such a chandelier. 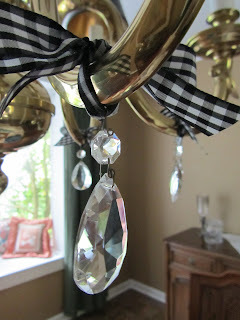 A few years ago, we went to replace the dining room chandelier in our cottage-y home. Our house was built in the 70s and the light fixtures sure showed it. As a replacement, we found a beautiful brass chandelier, with handsome candlesticks and shades. It was on clearance at Lamps Plus, the floor model. That red clearance tag always makes things more attractive to me, go figure. I hear that same red tag will repel others. So, we took it home, and my husband swapped it out for our very old, very 70s light fixture. We've been enjoying it ever since. Yet, I've always had this longing for that crystal chandelier. Last month, my two daughters and I went vintage/antique browsing, up in Snohomish (same place as the other day). In one of the shops I spied a glittering basket of crystal pendants, all shapes and sizes. I zeroed in on the large teardrops. As I picked through the basket, I was trying to imagine a way to suspend them from our brass chandelier. I like decorating projects to be quick and easy, so my more complex ideas were quickly given the boot. Then it occurred to me, why not tie them on with a pretty ribbon? 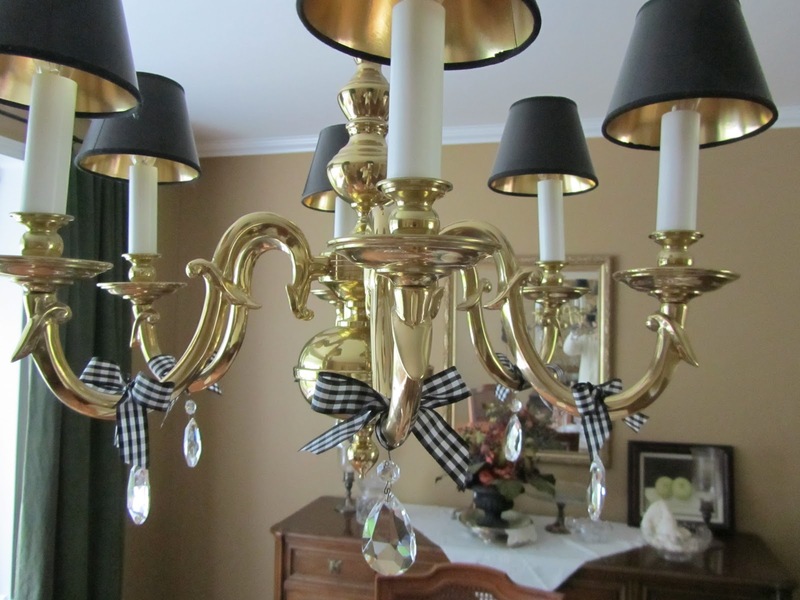 And, as I like to juxtapose differing styles, plaids and ginghams came to mind, to offset the elegance of the crystal and the weight of the brass arms. So I picked out the best 5 pendants and home we went. Of course, what should I discover once home? Our chandelier has 6 arms, not 5. The other day when we ventured up there again, my girls had their own agendas, but to get that last pendant was mine. This afternoon, I cut the ribbons and tied a pendant to each arm. I think I mentioned that I like decorating to be quick and easy. Well, this took about 30 minutes, and not a second more, and that included giving the chandelier a good cleaning, cutting the ribbons and tying them on. The cost? About $15 for the crystals and $2.50 (with a coupon) for the ribbon. Not only was this less expensive than one of those over-the-top crystal fixtures, but I think the style is much more in keeping with our cottage-y look. And I can change out the ribbons with the seasons. I'm thinking burgundy velvet for Christmas. It may not be your taste. But my point (other than showing something off to you) is that there are always alternate ways to do things, with similar pleasing results. What sort of things have you "thought outside the box" and been pleased with the results? That's funny - I just came on here to ask if you bought anything on your vintage/antique shopping trip/picnic, so now you've answered my question! (Although I'd still like to know what your daughters got!?) The ribbon-tied crystals are a great idea and I love them...I'm trying to envision where I could introduce crystals into our house, but sadly it's not really that kinda house! HI, we must've crossed paths. I was just on your site leaving a message! My girls wanted to buy a video, but they forgot (and they didn't tell me that, otherwise I would've reminded them). One of them did spend a fair amount of time looking through the vintage sewing patterns. It was late in the day and I'm afraid I rushed her a bit. Next time I'll spend more time with her going through the large box. Sewing patterns, which normally would cost $10 US, and up, were just $2.50 there. My other daughter loves to look through all the books. She spent a good hour and a half, sitting on the floor, reading in one store. And they both loved the vintage jewelry. One store had a very nice collection of clip-on earrings. As none of us have pierced ears, this is a good option for us. Earrings in most retail stores are pierced only. I bring a camera and get many good decorating ideas as well. Really, there is so much to look through, this is a multi-day excursion. We'll be going back in a another few weeks! I think it fits YOU! I don't have a creative bone in my body, well, to a degree, when it comes to the home, I always admire what someone else does with their home! Hi! Thank you. And I bet that's not all true about you not being creative. Judging from how you've laid out your blog pages, I'd say you have quite a bit of creativity. I think your blog has a cute look to it! Thanks for commenting. Thanks! And it didn't break the bank!